1. Below is the schedule for Tryouts for the 2018-19 travel seasons. 2. After being offered a roster spot, players must provide a $250.00 travel fee to accept the position. This fee is non-refundable. No exceptions. Without payment, the roster spot will be offered to the next available player. 3. Players will also need to post a $250.00 bond check. This fee may be earned by selling ads for the UTSA Sponsorship book. 4. 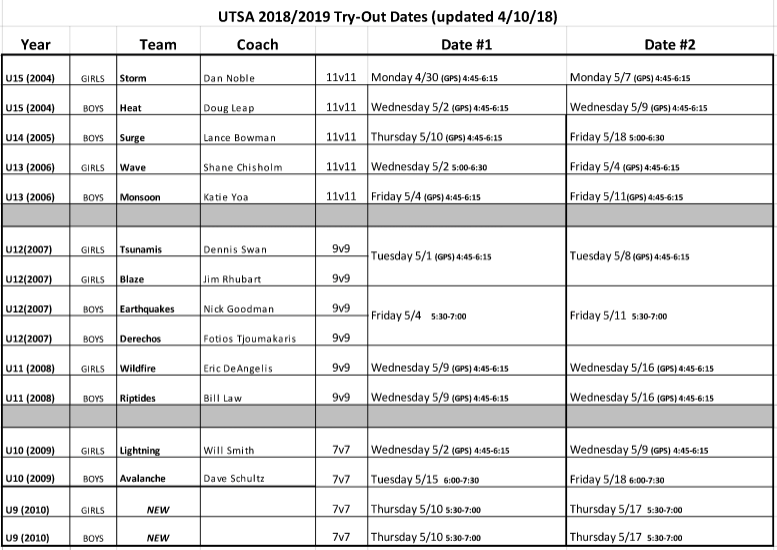 UTSA recommennds players try out for their birth year. Players may play up one year. UTSA recommends talking to the specific coaches if the player is interested in playing up. 5. ALL PLAYERS MUST REGISTER IN ADVANCE FOR TRYOUTS. Copyright © 2001 - 2019 Upper Township Soccer Assn. All Rights Reserved.